Each year as autumn begins to come to an end, the impending season of winter hangs over my head like a foreboding dark and heavy cloud. I feel as though I spend the winter months holding my breath while waiting anxiously for color and life to return to the world outside our frozen window panes. Last winter was particularly difficult for me. In the fall we lost a second baby to an early pregnancy loss. As the leaves began to lose their color and the first snowflakes of winter began to make their appearance with still no pregnancy news to share, my gut told me that something just wasn’t right. I began to research common causes of pregnancy loss only to discover that I had all of the classic signs of low progesterone. I was convinced that my progesterone levels could be confirmed and adjusted with a simple, inexpensive blood test and a prescription from my doctor. After meeting with two separate physicians, I was told by both that there was nothing they would do until I experienced a third loss. It was not that they couldn’t do anything but that it just wasn’t common practice to test for low hormone levels until after a third miscarriage. I was crushed and truthfully, in disbelief. How could one whose job was to heal and help sustain life – so easily shrug off the loss of a baby as if it were as simple as a common cold? Why should our family have to experience another loss before someone would advocate on our behalf? At the encouragement of a close friend, I began to research natural ways to increase progesterone levels and I began to proactively make changes to improve my health. All around me friends and acquaintances were announcing baby news. Within my church small group, four sweet mommas announced their own pregnancies but instead of experiencing joy for them, my grief manifested itself into envy and bitterness. I began to question God’s heart for me in the midst of my grief. Attending church and Bible study became a real struggle. I felt like such a fraud. How could I authentically worship God, while I was questioning His goodness? Looking back now, I believe this season of heartache and wrestling with the theology of suffering was what began to unearth the hardness of the soil of my heart. I didn’t recognize it then, but new roots of faith were beginning to form as necessary deaths were happening. I desperately needed to come to a place of fully trusting God’s love for me in the midst of suffering and His bigger picture plan for our family—with or without another baby in our future. I began to see new growth taking root within my heart. In this life there will always be seasons of pain while others are experiencing joy. I had to come to a place where I was able to simultaneously experience grief while also being able to celebrate seasons of joy with others. I believed that there had to be a way to experience both the sorrow and the dancing--without one making the other less important. I began to intentionally pray that God would give me an overabundance of joy for other mommas expecting new life. Slowly but surely, I began to recognize joy taking the place of the anger and bitterness that had taken up residence in my spirit. I also had to wrestle with the harsh possible reality of the word, “No.” Could I move forward in faith and be at peace if God’s best for our family was to keep us as a family of four? What if, in this lifetime, that’s how He planned for us to glorify Him best—as a family of four? It was a true battle for me to surrender this part of my heart to the Lord. I didn’t want His answer to be, “no.” This certainly wasn’t my vision for our family. What if my vision didn’t line up with God’s? Would I be able to trust that His heart for me, and for our family was in fact good, even if it looked different than what I had imagined? It was in this season of wrestling that I connected with Lauren Bourne to design coloring pages for the I Am Fruitful Coloring Project. As I began to draw and design my pages, a lot of my anger towards God began to dissipate. The first page I designed was of a little mountain town. I imagined a town full of grievers. Families struggling to grapple with the concept of a good father and a loving God in the midst of sadness. My overall sense when designing this page was that God’s love was big enough and lavish enough for this quiet mountain town full of sadness and grief. When our sadness seems so overwhelming to us but simultaneously so small and insignificant in the midst of a great big world, we can trust that God’s love is hovering over it all and covering us under the protection of his Father heart. I designed my city page with a similar mindset. So often life can feel so big and grandeur that it feels like our sadness and grief just gets lost in the shuffle. People forget. Life moves on. But even in the midst of the tallest buildings and the flashiest of lifestyles, God hasn’t forgotten. Our sadness is etched and carved into the tree trunks that are rooted in the ground on the outskirts of a big city skyline. They are planted there as a reminder to us of His love in small gestures and signs in the midst of the bigness and overpowering world around us. This love – the love that Is expressed in the small and seemingly insignificant details of life—this is the love that I experienced one day last spring. It was the morning of May 18th – our baby’s due date. I woke up with the overwhelming sense that God was asking me to move into a season of complete healing and to let go of the grief I was still hanging onto from the past nine months. I specifically heard the words, “See I am doing a new thing.” I didn’t know where the words had come from but I thought I had recalled them being from a line of scripture. It was later in the morning that I walked outside to find our first bloomed flower of the spring season – a single pink Peony. “See, I am doing a new thing! Now it springs up; do you not perceive it?” It was then that I found peace in knowing that beautiful things were in store for a new and redemptive season, even if it did not include adding a baby to our family. Later on in this same day I met with a doctor for a health issue completely unrelated to anything fertility. While meeting with this doctor she looked at my medical chart and asked if I was still trying to conceive. She was the first doctor to acknowledge and validate my concerns over low progesterone and before leaving her office we had made a plan for me to go on progesterone during my next cycle. Later that same week I would take my first positive pregnancy test in nine months. At the time of taking this test, I believe my body was already in the process of trying to miscarry. As fate (or God) would have it, the on call doctor just happened to be the same physician I had seen earlier in the week. Within 2 hours of holding my positive pregnancy test, I was also taking my first dose of progesterone. All bleeding and signs of a miscarriage stopped within 12 hours of taking this emergency prescription. To God be the glory, our beautiful daughter Evelyn Hope was born last month. Evie’s life is a testament to God’s great love for me every time that I look at her. Not just because she is here but because of the ways God changed my heart as I waited for her to arrive. Because of my season of waiting, I was briefly given a glimpse of what so many hurting women go through as they spend months and years waiting to conceive. My heart has forever been softened to this type of pain. I am oddly grateful to have a window into this type of grief as God has given me such a heart to do life with women who are hurting. Without walking this road myself, I would not be able to fully understand what so many women experience as they grieve the loss of life and wait in hopeful expectation for the chance to carry a baby. As I sit here, typing with one hand and holding my beautiful Evie in the crook of my other arm, I am overwhelmed by God’s lavish love for her and for me. He put so much thought and intention into bringing her here to us. There was a time when I scoffed at God’s timing. I was angry and bitter that He made me wait and allowed for me to experience so much pain. In reality, it was just my vision of God’s plan for our family and for her life that was just very small and weak. The growing pains, the unearthing of the soil of my heart, the planting of new roots -- it was all worth it for this beautiful girl to join our family in the way that she did. Each year as the winter frost begins to thaw the ground and the peonies begin to bloom, I will share with Evie the great love that God has for her and how one winter changed everything for this momma’s heart. 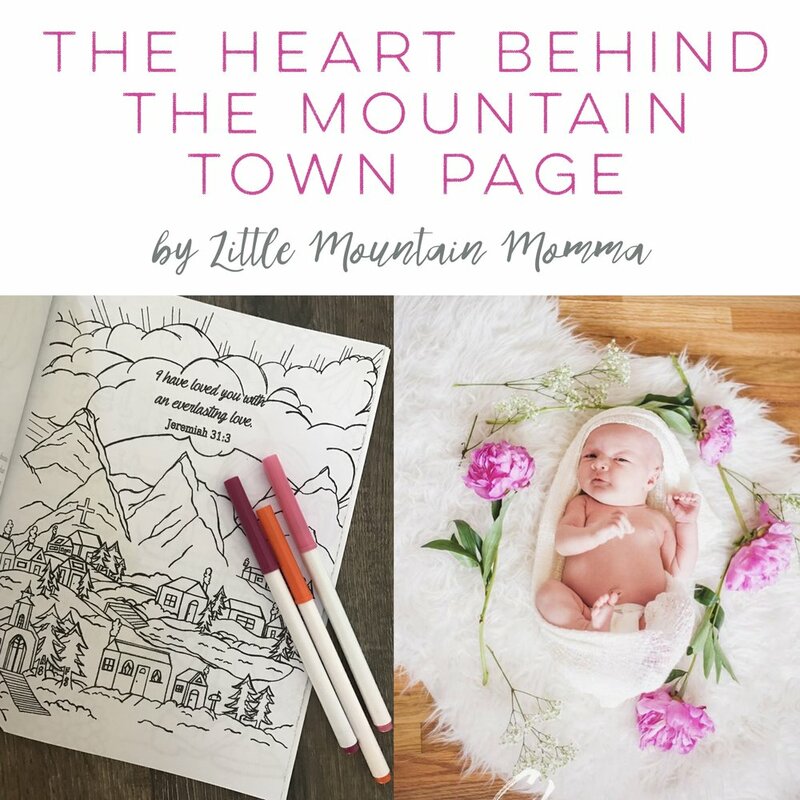 A big thanks to Brittany Baker (aka, Little Mountain Momma) for sharing her story and the heart behind 2 of my favorite pages in the coloring book! Click the link below to get your copy! Brittany's family moved from the big city to the mountains, and now she has an amazing blog called Little Mountain Momma, where she shares her heart. I've cried, laughed, and felt my jaw hit the floor (because of her amazing perspective) many times reading her posts. I highly encourage you to check her out HERE... you'll be filled with hope and feel you've made a new friend!